The jade plant you grandmother grew is so yesterday. 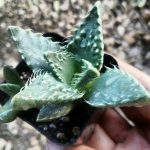 The popularity of succulent plants has exploded in recent years, due not only to the low care requirements of these sun lovers but also because of the diversity these fascinating plants. Special anatomical adaptations and colors make some succulents look like they belong more on another planet than on our windowsill. Here are ten unusual succulents that will add personality and distinction to your garden or houseplant collection. temptation to touch the strangely serrated leaves. In addition to the exciting leaf form, the plants produce golden yellow flowers that nearly obscure the plant in fall and winter. Pebbled tiger jaw plants fill a niche for those who want to grow a succulent in a shady spot. If the plants become too dry and the leaves separate from the stems, you can use them to start new plants if you act quickly. Crinkle Leaf Plant (Shown Above)- A South African relative of the kalanchoe, crinkle leaf plants (Adromischus cristatus) feature triangular leaves with lightly ruffled tips. Crinkle leaf plants tolerate a light frost, but grow best in a cool sunny spot with infrequent waterings. Red and white flowers may peek out between the two-inch leaves on mature plants. Plover Eggs – Adromischus cooperi sports pudgy leaves dotted with purplish speckles. The plants are especially sensitive to frost so perfectly used indoors through winter. The speckles on plover egg plants will become more pronounced in brighter rooms. Plants are easy to propagate by leaf cuttings. Twist off a leaf from the stem and insert into the moist cactus mix. Roots will form in four to six weeks. 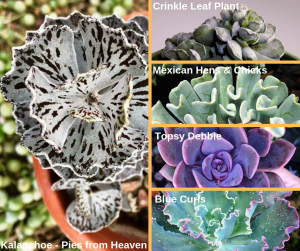 Mexican Hens and Chicks ‘Topsy Turvy’ (Shown Above) – encompasses hundreds of rosette-forming succulents native to Mexico, Central America, and South America. The squared-off leaf tips of ‘Topsy Turvy’ give it a sea urchin appearance and look handsome when planted in groups or combined with other succulents in a dish garden. Plant ‘Topsy Turvy’ in a chartreuse pot to show off its pale bluish-green leaves. 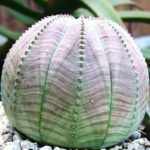 spherical shape adds heft and textural to plantings, but don’t bear the spines expected on a cactus type succulent. Weekly watering baseball plant very happy. Petite flowers appear on the top of the globe, and lets you know this plant is thriving. Graptoveria ‘Topsy Debbie‘ (Shown Above) – form rosettes of leaves that spread by offsets, which readily form new plants for your propagating pleasure. Plants grow best in a bright room for ideal health and vigor. 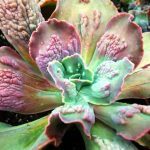 something this Thanksgiving fowl has in common with echeveria ‘Barbillion:’ they are both carunculated. This term refers to a bumpy, fleshy growth and beautifully hideous. Give it plenty of light and water sparingly, and this unique succulent grows on you. Echeveria ‘Blue Curls’ – (Shown Above) A single specimen makes an exquisite statement in a container with its frilly leaves and pink and aqua coloration. Prevent water from accumulating within the rosette and remove dead leaves from the plant’s base to keep pests from interfering with its vigor. 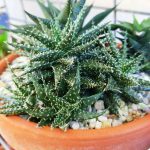 Aloe hawthoroides – aloe has gotten an update with dozens of feathery bristles on each leaf. This highly touchable plant has a moderate growth habit and grown in any room in your home. 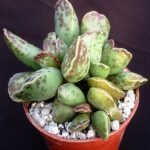 Kalanchoe rhombopilosa (Shown Above) – Who can resist a plant called “pies from heaven?” This kalanchoe is but one of the many strange and beautiful living things that hail from Madagascar. The leaves are fuzzy, grey and covered with brown streaking. Insignificant yellow flowers appear on stalks in the spring. Kalanchoe prefers growing in rooms with abundant light. 2019 Succulents and indoor design ideas on Watters Pinterest Board. Each ready for indoor planting and fun. GARDEN ALERT! – Tree aphids are rampant in mountain gardens and do real damage. Look for dark colored aphids the size of spiders on the tips of your pine, apples, aspen, and roses. Leaves will appear glossy, and the ground around infect plants seem wet. Aphids only get worse at the nights grow colder, and samples have been coming into the nursery from all over the county. Use a hose-end sprayer and administer ‘Watters Multi Purpurpose Insect Spray‘ right away. 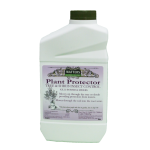 For really tall trees and to protect plants for the entire year also administer systemic ‘Plant Protector.‘ This one-two punch eliminates insect issues through next spring as well. If in doubt, bring a photo to the garden center for exact diagnosis. Until next week, I’ll be here at Watters Garden Center helping local gardeners create their own succulent gardens.